District Heating in the UK is growing in popularity as it is ideally linked with renewable energy sources, such as Biomass or Biogas. There are dramatic improvements in energy efficiency by producing heat on a local level and also maintenance benefits in having one single plant. 2. What is District Heating? -Most of us understand a little about Underfloor heating but what about cooling? Is it possible to put chilled water through you Underfloor heating system and provide cooling? What are the benefits? What are the pitfalls? This introductory seminar will look at many of the issues. The seminar will cover Basics Principles of Underfloor Heating/Cooling, Energy Savings, Component, Design, Installation , Applications and References. Earth tube or ground air heat exchanger is a well established way to achieve passive house ventilation and use the earth as a energy source for both cooling the air in summer and heating it in winter. REHAU’s Ground air heat exchanger has been used in the UK and across the globe to produce some stunning low energy buildings. This online webinar will cover an Introduction to REHAU, How a Ground-air Heat Exchanger (GAHE) works, Requirements for GAHE pipe material, Design / installation criteria, Design software for GAHE and look at some Case studies. 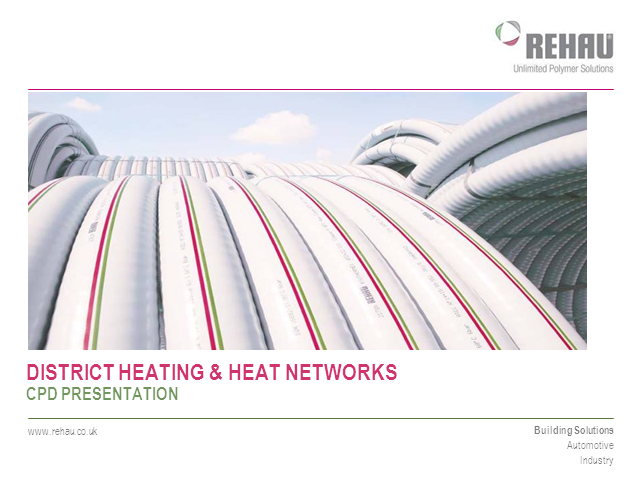 Basic introduction Rewewables, including ground source heating, earth tubes, underfloor heating & cooling, fenestration, water management, district heating and using waste to generate energy. Most solar thermal systems will produce all the hot water required by a property by 10am on a good sunny day. How can this energy be used? Solar recharged grounds source systems is becoming more a more popular across the globe. This seminar will look at a number of systems and how solar thermal systems are used for heating. From small domestic systems through ICAX’s interseasonal heat storage systems to large German & Danish solar thermal district heating schemes. Heat pumps are low energy devices. Typical COP are in the region of 3 or 4 to 1. How about using solar energy? It’s sunny when it is hot and not when you need heating. Answer store the solar in the ground and use as heat source for heat pump in winter. Interseasonal heating, this joint presentation with ICAX will show you how to double your heat pump COP. Details of real operating projects. Ground source energy from energy piles or vertical boreholes is an increasingly popular method of providing renewable heat energy for building. What about using tunnels as an energy source? Is it feasible, worthwhile and what are the benefits? This seminar explores the issues and looks at some project examples where energy has been extracted from road and rail tunnels. Range of different CPD style presentations for building professionals.